Here is a little closer look at this adorable snow couple. In this photo you can see the liquid applique I used on her hat a little more clearly. I did add some Dazzling Diamonds to the applique before I heat set it to give it a little more sparkle. This is what the inside looks like when it's all unfolded. The pouches inside are large enough to fit a standard size card and envelopes, a CD, or even 4x6 photos that you'd like to share with someone special. 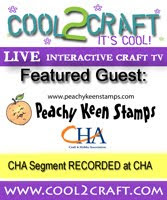 Please be sure to head over to the Peachy Keen Challenge Blog to share your creation for this challenge. Just for playing along, you will be entered into a drawing for a fabulous prize. While you're there, you MUST check out all the other gorgeous creations by Viv, Nikki, Emma, Jacqui, Janice, Angelica, and Kathy. There's always an abundance of inspiration when this talented group is involved!! Enjoy!! Thank you for your visit today! I wish you a day filled with blessings and happy stamping!! Oh Lorie!!! This project is one of the prettiest and cleverly done I've ever come across! You are amazing and I'm so envious of your fabulous colouring! (What mecium have you used? Is it inks)? Whatever you used, it's awesome my friend. WOW! This is amazing I love the purse, and those snow people are adorable and your coloring.. WOW AMAZING!!!! Oh my! This is just gorgeous, Lorie! I love the snowpeople!!! And you creation is amazing! awwww, how cute is this!?! Wow!! It reminded me of that adorable purse you made for the very first Cutest Card Swap but this is beyond a purse...wow...what a fantastic project!! You never cease to amaze me!! AWESOME! I agree with Viv! Your coloring is stunning! The whole project is gorgeous! You inspire me to try harder and keep practicing. Thank you! I meant it when I told you the first time - this is just perfect! Function and beauty all in one!!! Thank you, thank you for sharing your inspiring design with us! Your coloring is, as usual, gorgeousss! Holy smokes! Lorie, this is just so amazing and wonderful! The snow peeps are just so cute and beautifully colored. I love the cut hearts and lace border! And then you open it up and your draw drops even more! Okay, seriously, I'm gonna need a tutorial on this! Just fantabulous! LOVE IT!!!! oh sca-ream! I love this. The colors, the image - all of it. So incredible. I'm simply awed. Oh heavens! This is incredible!!!!!! Not only is the image beautifully colored up and embellished, the project is stunning!! Wow! What a beautiful creation, Lorie! Darling snow people and love the gorgeous papers and embellishments!! You are absolutely the best at creating fantastic cards!!! LORIE!! Your project is absolutely perfect in every way! I LOVE how you colored the hildebrandt hearts snow couple! The inside is as beautiful as the outside too!! Thank you my dear friend for always doing your best.. but how is it that you just keep getting better? LOVE YOUR PROJECT, Lorie! Thank you so much!! Hello, Lorie! I'm finally getting back in the swing of things blog-wise. You have been a very busy lady! This Valentine bag is precious! So beautifully done. Your coloring is amazing! Ohhhh Lorie! Put me in line for the tutorial, too! This is just unbelieably sweet and lovely - you really worked hard on this and it shows - it's so full of detail and deliciousness! I think this is one of the finest of your projects! You are amazing! Your purse is simple adorable! I just love it all. The colors, the snow people, the lacy border and beautiful ribbon handle! WoW, such a lovely job! !